I wanted to throw some attention to Marie Benedict’s second book, Carnegie’s Maid, which comes out January 16th 2018. Scroll down to see this great giveaway for a finished copy of the book (US only). From the author of The Other Einstein, the mesmerizing tale of what kind of woman could have inspired an American dynasty. Open to legal residents of USA who are 18 years or older. Giveaway begins January 15th and ends January 31st. Enter the Giveaway during the Promotion Period online by submitting the entry form. The entry form can be found on the following website at. Winner will be selected by Random.org and be notified by email. Winner has 48 hours to respond before a new winner is selected. 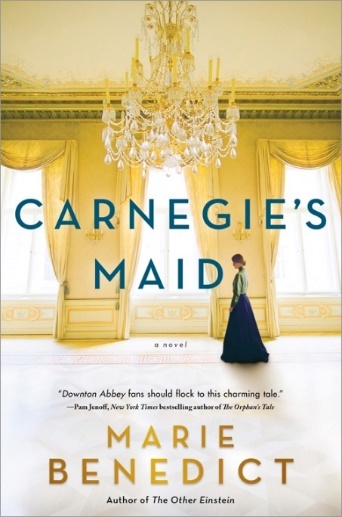 3 winner(s) will receive 1 finished copy of Carnegie’s Maid (approximate retail value or “ARV”: $25.99US). By providing your information in this form, you are providing your information to Sourcebooks. Sourcebooks does not share or sell information and will use any information only for the purpose of this giveaway. (Facebook, Twitter, and Goodreads) are in no way associated with this giveaway. What public figure is your guilty obsession? I’m so desperate to read this!! Doesn’t it sound so good!?! It’s on Netgalley!